If you're like me, when the high school hockey season ends, you can't help but start looking ahead to next year. In what has become an annual tradition, I've compiled my version of the way-too-early rankings for next season. As always, this list was created assuming all non-seniors will be back with their high school teams next season. We all know that will not be the case, but a man can dream. Last year's list (please ignore Moorhead and Grand Rapids). Feel free to lambaste or agree with my selections in the comments so we can start the conversation on the 2018-2019 season. How does a team lose the Mr. Hockey winner (Walker), a Mr. Hockey finalist (Koumontzis), a 40-point scorer (Crosby) and its starting goalie (Mackay) and enter the season as the favorite? Well, having what might be the most talented defensive corp in state history certainly helps. The Hornets didn't have a single senior defenseman on their roster this year, and they have two Division I defensemen who didn't play with the varsity squad waiting in the wings. Sophomore Ben Dexheimer is committed to Miami University (Ohio) and played on the junior varsity all season, while Minnesota commit Nick Williams was on the Bantam AA team. Both will battle with Minnesota commits Ben Brinkman and Jake Boltmann, Wisconsin commit Mike Vorlicky, Mason Reiners and the remainder of this year's varsity defensemen for spots on next season's roster. It remains to be seen how the Edina coaches will find room for them all, but we can call that a good problem to have. The Hornets have Jett Jungels and Mason Nevers returning from 64- and 67-point seasons, respectively, but they'll have to replace a lot of scoring on the top three forward lines. The goalie position is a question mark as well, but Ramsey Bell played well in limited action backing up Mackay. 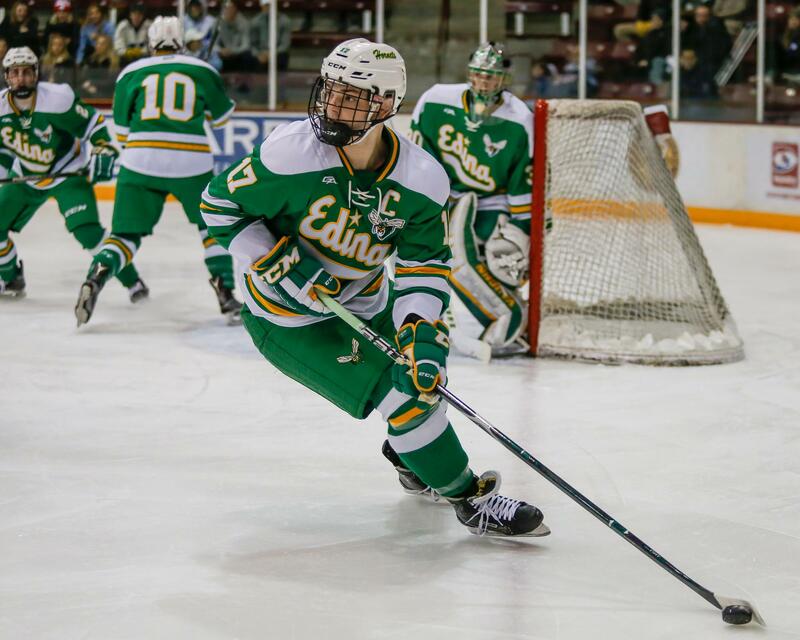 Luckily for Curt Giles, Edina is arguably the state's most talent-rich program -- one that doesn't rebuild, it just reloads. This pick may turn some heads because Andover doesn't have the pedigree of the state's other top programs. However, looking at the Huskies' blind resume, it would be difficult to find a more impressive team heading into next season. Andover went 20-5 in the regular season and took state runner-up Duluth East to overtime in the Section 7 final. The Huskies lose only one player who scored more than 11 points (McNamara) and have the early favorite to win the Frank Brimsek Award -- Ben Fritsinger -- returning in goal. Juniors Charlie Schoen and Nick Dainty will lead the offense, but the key to Andover's success will be a group of immensely talented sophomores taking a step forward. If they do, the Huskies should be viewed as the favorites in Section 7. The state champs lose a lot of talent, but don't expect a Grand Rapids-type falloff from this bunch. The Skippers' defensive pairing of Grant Docter and Josh Luedtke was already among the best in the state during the title run, and it should improve next season. In fact, they could help the Skippers boast Minnesota's most talented starting lineup with Bobby Brink, Teddy Lagerback and Jack Bayless at forward, and Charlie Glockner between the pipes. The strength of this year's team was its depth, so Minnetonka must round out its roster with some complimentary players to have a similar advantage next season. There is the potential for a slew of early departures now that these players have won it all. If Skippers coach Sean Goldsworthy can convince the group to stick around, Minnetonka will have a legitimate chance to repeat as state champs. The defending Suburban East Conference champions have their eyes on bigger prizes heading into next season. Sophomore Matthew Gleason tallied 30 goals this season and is a superstar in the making. Junior goalie George Maguire split time with Cavanagh and should have no problem taking over in goal. Danny Magnuson, Nick Davison, Grayson Milosch and Zach Brydges will also play major roles in trying to help the Raiders return to the state tournament for the first time since 2009. The famed WMD line powered Duluth East to a second-place finish at state this season. While Worth and Mageau are moving on, Ryder Donovan will return. There aren't many more exciting players to watch than Donovan and Ricky Lyle, so the prospect of the two playing on the same line gives Greyhound fans plenty to look forward to next year. Logan Anderson, Brendan Baker and Jack Fitzgerald round out a forward group that shouldn't take much of a step back, while Frederick Hunter Paine and Carson Cochran will lead the defense. Junior Lukan Hanson began the season as the 'Hounds starting goalie -- until Kleive got hot and took over -- and gives the team a returner with experience in goal. Another positive for Duluth East: it shouldn't have to worry about early departures as much as other top teams. Donovan stated he will be back. While he can change his mind, coming so close to winning a state title could provide enough motivation for him to stay and to carry Duluth East over the top next season. Those who follow the Minnesota high school hockey landscape closely know that something has been brewing in Chaska the past few years. All of that talent should continue to materialize into victories as the Hawks return a staggering 96 percent of their scoring next season. Junior Minnesota commit Mike Koster is finishing out the year with Tri-City in the USHL and is a flight risk, but he will be a Mr. Hockey finalist if he returns. Chaska features at least three other future Division I players in Omaha commit Blaine Warnert, Wisconsin commit Shane Lavelle and Minnesota commit Rhett Pitlick. Starting goalie Justin Bach will also be back after winning 12 games as a junior, helping the Hawks head into next season with all of the pieces in place. A lack of experience should no longer be an excuse as coach Dave Snuggerud looks to take Chaska to its first state tournament. Scoring should not be an issue for St. Thomas Academy, which is loaded with junior forwards. Led by Colorado College commit Rob Christy, the group includes Brendan McFadden, Ryan O'Neill, Luke Herzog, Ben Stucker and Nico Vega, giving the Cadets a potent offensive punch. Every year, St. Thomas Academy seems to have a defenseman who takes a huge step in his development as a senior. Last year it was Robbie Stucker. This year it was Foley, and next year it could be Thomas Winges. Atticus Kelly, this year's Brimsek award winner as best senior goalie, leaves some large skates to fill, but Muzzy Donohue filled in adequately when Kelly was out for the first three games of the season. Rosemount could present a tough challenge in Section 3, but the Cadets should still be viewed as the favorites as they continue their quest for their first Class 2A state tournament victory. In what many considered a rebuilding season, Hill-Murray knocked off archrival and top-seeded White Bear Lake in the Section 4 championship to advance to the state tournament. The Pioneers will be young next season, but they should be even better with a year of experience under their belts. Wisconsin commit Ben Helgeson should be a Mr. Hockey finalist if he returns. He will be joined by eighth-grade phenom Nick Pierre, who scored 10 goals in just 13 varsity games. Sophomore Minnesota-Duluth commit Brett Oberle joins freshman Matthew Fleischhacker and junior Ryan Petersen to form the core of the defense. Sophomore goalie Remington Keopple got better as the year went on and posted a .934 save percentage in the section tournament. White Bear Lake remains a difficult team to defeat in the section -- as will an improved Stillwater squad -- but expect the Pioneers to be in the mix for another trip to St. Paul next season. Another young team that's high on potential heading into next season is Maple Grove. Goalie Ethan Haider is only a sophomore, but he already has two years of experience starting at the varsity level. Forwards Trevor Kukkonen and Tyler Kostelecky led the team in scoring as juniors. Kukkonen and his younger brother Kyle, who should make the team next year, are both committed to Michigan Tech. The younger Kukkonen's Bantam AA team is ranked No. 1 in the state, and the multiple Division I recruits on that team will start to filter up to the varsity level next season. Notre Dame commit Brock Faber is considered by many to be Minnesota's best bantam player and was the only bantam among the eight Minnesotans to make USA Hockey's National Team Development Program Evaluation Camp roster. Sophomore Minnesota-Duluth commit Connor Kelley also made the list, so he and Faber are early departure risks if they can manage to make that team. While the Crimson will be the favorite in Section 5 next season, they should also be a force to be reckoned with in the years to come. Everything was in place for White Bear Lake to win the Section 4 championship and advance to the state tournament this season. However, history repeated itself and the Bears were upset by Hill-Murray in the section final. To make matters worse, White Bear Lake's top line of Hamstad, Jennrich and Carroll is gone. But there's good news for the team, as plenty of talent remains to fill the void and help the Bears make a serious run at state next season. A defense consisting of freshman Minnesota-Duluth commit Owen Gallatin and juniors Spencer Millard and Jake Klein will be as good as any in the section. Junior Evan Foss went 11-2-0 and posted a 1.53 goals-against average while splitting time with Uremovich. The forwards will be led by Billy Rose, Blake Meister and Chase Bill, while the trio will receive reinforcements from a group that won the Bantam AA state championship last season. With all of that talent on the roster, White Bear Lake has a great chance to face Hill-Murray at Aldrich Arena in the Section 4 championship again next year.